The critical response to Ciaran O’Reilly’s Shadow of a Gunman is overwhelmingly positive. Many papers and blogs have given the production rave reviews. The production runs as part of the Irish Repertory Theater’s Sean O’Casey Season until 25th May. Click here for more information and to book tickets. [W]hen the play takes its uncorrectable skid into tragedy, there’s enough dramatic force to make you feel for the characters, even the ones you laughed at. At nearly 100 years old, O’Casey’s play still packs heat. The cast is miraculously right, though none of the 10 actors appear to be “performing.” Instead, they create the wholly persuasive illusion of being a group of ordinary people who are simply living their lives. O’Casey is one of Ireland and the world’s great playwrights, and his talent is on full display in this taut, swiftly paced production. [D]irector Ciarán O’Reilly presides over an embarrassment of riches from lead to bit player. Some authors burden the stage with characters not integral to the plot. O’Casey illuminates shades of perspective. His players are rich and symbiotic. 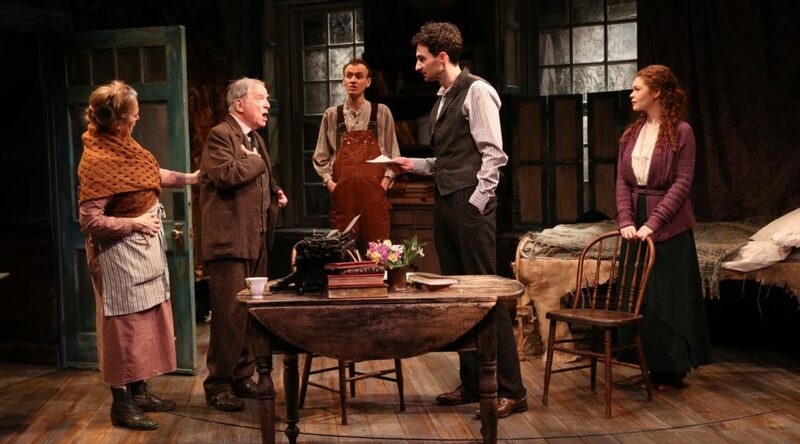 The general excellence of Irish Rep’s production of The Shadow of a Gunman makes one look forward to seeing the next two shows in its O’Casey Cycle. Let’s mention, finally, that the playbill features several pages of historical context as well as a glossary that theatergoers likely will find to be helpful in appreciating these classic plays.